If you are fed up of your old and junked car, you are not the only one trying to sell it off. You are one of the many car owners in the city who are willing to let their vehicles go even for the value of scrapes because you are frustrated with it sitting in your garage and being of no use. But who said it is not going to fetch you a good price? 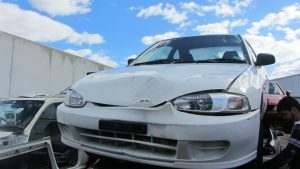 You can get a good amount of cash for cars in Perth if you happen to know a good car wreckers firm in the city. It is actually very simple to get cash for cars in Perth. You get easy car removal services from the leading car wreckers in the city and you don’t even have to lift a finger. Well, actually you might have to lift a few fingers just to pick up your phone and dial their number which is about it. You can begin by looking for a car junkyard or automobile salvage company and you will find some really reliable names in the cash for cars business in Perth. All you have to do is get in touch with them and call them home or wherever the car is located. Just tell them about the vehicle you are interested in selling and they will give you a quote right on the phone. If you want, they are also willing to come in as soon as they can or at a time given by you and begin with the assessment of the vehicle right there. You won’t have to do anything at all after that other than checking your car of all the valuables that you might have lying about in it. The offer they give you will be something you won’t be able to resist.